SAN JOSE, Calif. -- Sharks Executive Vice President Doug Wilson today announced the team’s roster for the three-game rookie tournament against prospects from the Anaheim Ducks, which will be held at Sharks Ice at San Jose. Games will be played Sept. 7-9, 2009 at 7 p.m. Seating for the Anaheim-San Jose Rookie Games is limited to the first 850 fans. Admission is $10 for fans 13 and older and $5 for fans 12 and under. All proceeds will directly benefit the Jr. Sharks Scholarship Fund. Tickets will be on sale at the door on each game day beginning at 5 p.m.. All games will take place on the North Rink. Following the tournament, the Sharks veterans are scheduled to hit the ice on September 12, as their 2009 Training Camp begins at Sharks Ice at San Jose. The Sharks first preseason game will be Sept. 17 vs. the Los Angeles Kings at Citizens Business Bank Arena in Ontario, California. 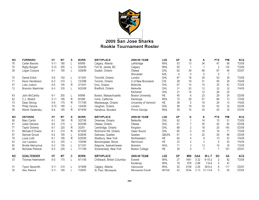 For the complete Sharks Rookie Tournament roster, click here (PDF).